Dimensions: 60" x 42" x 42"
Shelf Tower, Knock-Down Maple, 54"x 24" x 24"
Shelf Tower, Knock-Down White, 54"x 24" x 24"
Shelf Tower, Knock-Down Black, 54"x 24" x 24"
Merchandiser Tower, Knock-Down Black/Maple, 48" x 24" x 52.5"
Merchandiser Tower, Knock-Down Black/White, 48" x 24" x 52.5"
Merchandiser Tower, Knock-Down White, 48" x 24" x 52.5"
Merchandiser Tower, Knock-Down Black, 48" x 24" x 52.5"
Display Table and Shelf Towers for your Store! Perfect for highlighting your clothing merchandise such as t-shirts, shorts, jeans etc. at your store. Choose from variety of options: 3-tiered maple waterfall table, black, maple or white merchandise towers. These display tables have 3 or 4 shelves. 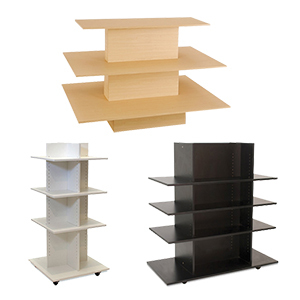 The knockdown ready-to-assemble display tables and shelf towers are made with MDF and laminate, and easy to assemble. This product will be shipped VIA common carrier. Freight will be quoted separately. You will be notified of the freight amount. FOB pricing from different locations in US. Check with sales representative!